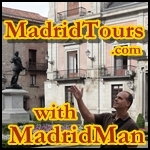 A few weekends ago, early June 2013, I spent Friday and Saturday night in downtown Madrid while a friend was visiting. I’d reserved Hostal El Pilar on Calle de Carretas, 13, just about 80 meters from the Puerta del Sol’s south side, on the same street as the famous Real Casa de Correos. It was my first overnight stay in a Madrid lodging establishment since moving here in 2005. Why did I choose Hostal El Pilar? Answers: Location, price, and reviews. 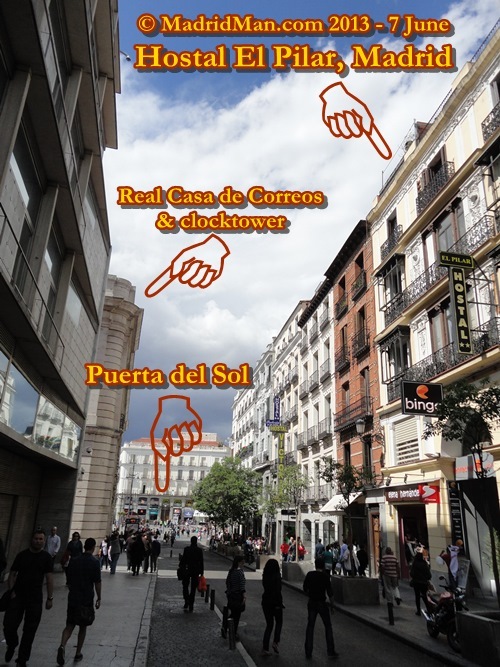 Location: The location couldn’t be better, right next to the Puerta del Sol and literally a stone’s throw from the Real Casa de Correos and its clock tower. Price: I’d booked the 39€ room via MadridHostels.com (yeah, that’s one of mine, too) and thought that was a pretty good deal for a single room in downtown Madrid. Reviews: The Internet is great for such things and I used it to its fullest, searching reviews of Hostal El Pilar in Madrid, including TripAdvisor, Frommers.com, Fodors.com, and others. General: The building’s façade is beautiful, clearly historic and has an elevator to take you up to the hostal’s 2nd floor (which is the 3rd floor by USA standards). Mine was a single/individual room, number 318, and was located up the wooden stairs from the reception desk and at the very end of the hall. The window faced the “patio”, or air-shaft, two floors below the top floor. Location: The location couldn’t be better, just a stone’s throw from the Puerta del Sol and so close to everything in old downtown Madrid. Room Description: My single room had a single bed (called a “twin bed” in the USA), a small bedside table and a lamp, telephone, a wall-mounted flat-screen TV which worked well, closet, air conditioning unit, one window with curtains and roll-down blinds, and a small desk and chair. The room was cleaned daily including a change of bed linens. The room was light enough and quiet since it was at the very end of the hostal’s hall. Bathroom Description: Mine was a typically small bathroom – typical to “hostales”, that is. It had a half-bath with the metal hose and plastic shower head which you COULD attach to the wall connection to stand under the shower. This is a plus. The water pressure was good and there was hot and cold water whenever needed. The shower curtain doesn’t quite reach from wall-to-wall but does reach to the end of the bathtub itself. My initial worry was that the floor would get wet, but it never did in the 2 showers I took. The sink is tiny, just big enough in which to wash my hands. Since I’m one to wash my face before going to bed I had great difficulty keeping my face over the wash basin, plashing water on the floor. But that’s what towels are for, I guess. I also had to be careful not to hit my head on the glass shelf immediately above the sink. They provided a small bar of soap, a drinking glass and clean towels each day. The tap water tasted good and fresh. The Bed: If there is a negative I’d have to put on my Hostal El Pilar experience it would have to be the bed mattress quality. Mine was somewhat lumpy, far less than firm, and the springs sprung with shifting weight. It was also leaning slightly to one side. But for a couple nights, I could live with it. There were plenty of blankets, too. Cleanliness: All the living quarter space was very clean and in order, cleaned daily, so no issues there – thank goodness. The halls, reception area and stairs were all clean. Noise: This is an important detail for any hostal. Many times the room walls can be very thin and you can hear your neighbor snoring and talking or the trash being picked up at 4:00am – but not my room! As I mentioned above, mine was the last room in the upstairs hall so no one passed mine to get to theirs. Sure, I could hear people walking down the floor-tile hall and opening/closing their doors, but couldn’t hear – or didn’t notice – people talking once they were inside. And since my room faced the “patio”/air-shaft, I had no street noise whatsoever and slept peacefully both nights. Internet: These days, having an internet connection is absolutely necessary. Hostal El Pilar provides Internet Wi-Fi free to its guest (ask for the password upon checking in). When I reached my room on the far side of the hostal I was a bit worried the signal wouldn’t reach, but it did and never failed at any time during my stay. It was very reliable. Privacy/Security: Since my room faced the “patio”/air-shaft, the windows across the way and above, about 12-feet from my own, could easily see in my room if they looked. There was no problem leaving my window open at night for fresh air, either. . Room doors don’t lock upon shutting so you have to lock the doors from inside. Not a problem. Room doors use standard keys with wooden keychain bobs which must be left at reception upon leaving the hostal each time. The closet, with plenty of hangers, also had a combination safe into which one could put important documents or cash, I suppose, but I didn’t need to use it. Reception: Reception is staffed 24-hours a day. Since you have to drop-off your key upon leaving and pick up your key upon arriving, this is a plus. You also have to ring the door-bell button at the street-side entrance, too, to be let in. They have a video camera to see your face and will tell you to push the door open once they recognize/trust you. I met three different persons during my stay, all in their 30s, I believe, and all seemed to speak at least some English – although I spoke to them exclusively in Spanish. When checking in, I noticed there were 2 or 3 rooms facing the reception area. Avoid these rooms like the plague! There’s nothing worse than hearing the hostal phones ringing constantly, people requesting/dropping-off their room keys and checking in/out at all hours of the day and night. Summing-Up: Hostal El Pilar, for me, was a good and affordable choice for a couple nights. I know I could’ve had a bigger, more decorative, more modern room elsewhere at a higher cost (and maybe even with a door keycard and refrigerator, as my visiting friend had). But for me this small room was fine in which to sleep cheap in Madrid’s downtown. 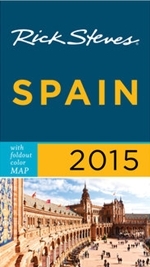 This entry was posted in General, Money, Travel and tagged bathroom, cheap, cheap hostels, cheap hotels, económico, habitacion, hostal, Hostal El Pilar, hostales, hostales baratos, hostales baratos madrid, hostales madrid, hostel, Madrid, near Puerta del Sol, pension, pensiones, pensiones baratas, Puerta del Sol, shower, single room, toilet. Bookmark the permalink. that is indeed a good price for the area, but what about the comforts, amenities, conditions of rooms etc??? now you got the full description here. It seems then as a good deal, will it be good for a family? Yup! You’ve got the full description, comforts and amenities in the blog. This entry only concerns my single/individual room – that which I experienced. I can’t comment on doubles or rooms for families.